Mid-century modern and industrial styles strike the perfect balance in this collection. With black steel accents an on-trend grey wash, these pieces offer unbelievable style at an unreal price. This collection includes Occasional, Media, and Casual Dining. Base is 8" from floor. 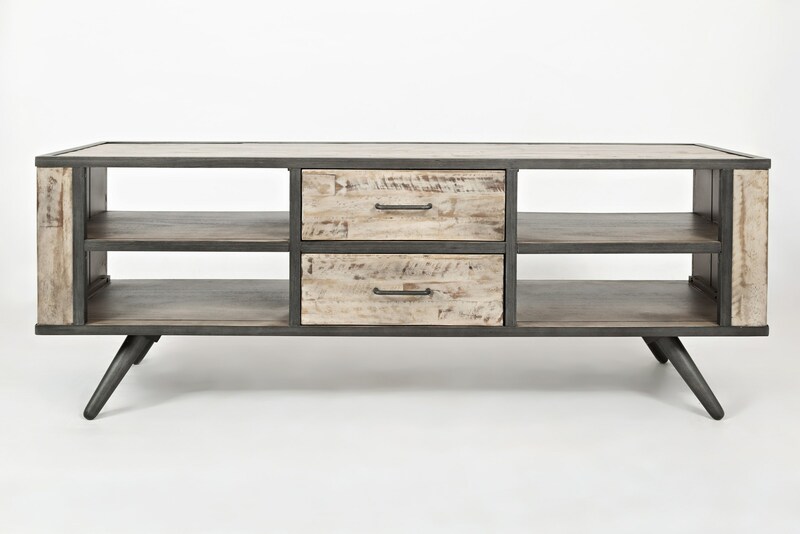 The American Retrospective Media Console by Jofran at VanDrie Home Furnishings in the Cadillac, Traverse City, Big Rapids, Houghton Lake and Northern Michigan area. Product availability may vary. Contact us for the most current availability on this product. Finish Subtle variations and distressing should be expected and enjoyed. Storage Drawer Dimensions: 15.5"W x 13.5"D x 4.5"H. Shelf Space: 21"W x 17.75"D.